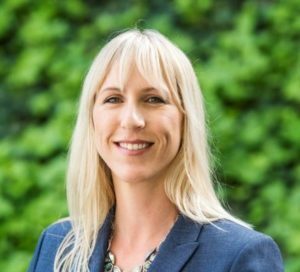 SALINAS, Calif. — Natividad Foundation, a nonprofit fundraising organization that works to strengthen Natividad, has hired marketing veteran Hillary Fish as its director of annual programs. In her new role, Fish is responsible for managing the organization’s special events, fundraising campaigns, marketing and communications. Fish’s marketing and communications career began with an internship in 2001 at Armanasco Public Relations in Monterey. After college, she joined San Juan Bautista-​based Earthbound Farm, the nation’s leading organic produce grower and shipper, where she managed national consumer events and marketing projects for 10 years. In 2013, she was hired by Salinas orchid grower Matsui Nursery to manage the company’s marketing and buying programs. Born and raised in Monterey County, Fish is a Salinas High School graduate and attended Hartnell College before receiving her bachelor’s degree in journalism and public relations from California State University, Chico. Fish has volunteered for nonprofit boards and committees nearly all of her career, including with Ag Against Hunger, California Women for Agriculture, Hartnell College’s Women’s Education Leadership Initiative and the Parent-​Teacher Organization at Dual Immersion Academy of Salinas. Natividad is a 172-​bed acute-​care hospital owned and operated by Monterey County. As the safety-​net hospital providing health care to the residents of Monterey County for more than 130 years, Natividad provides health care access to all patients regardless of their ability to pay. The hospital operates with a medical staff of nearly 400 physicians and has several specialty clinics and outpatient primary care clinics operated by the Monterey County Health Department. Natividad is a Level II Trauma Center providing the immediate availability of specialized personnel, equipment and services to treat the most severe and critical injuries.